Leo K3 is a producer, songwriter, engineer, vocalist, and live performer from Northeast Indiana. 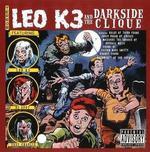 Leo K3 produced and wrote his band’s first album, The Battle for Innocence, which contains songs ranging from Hip Hop to Horrorcore. He has also produced songs and remixes for many of Fort Wayne, Indiana’s most notable Hip Hop artists. He has also collaborated with pop acoustic and rock acts. His remixes and songs have been featured on local radio programs.